to snare the market for romantic ballads. ROCKISTS have always turned up their noses at the commercialism of MOR fare. Metaloids and alterna-types wouldn't be caught dead listening to Celine Dion. This is utter nonsense, of course--the indie nation is big biz too. So when a smooth pop operator like San Jose's Jonathan G. declares that he wants to reach the widest audience possible, he's just being honest. For All to See (Goldstone), Gilmore's debut CD, is planted squarely in the post-Sinatra crooner tradition. 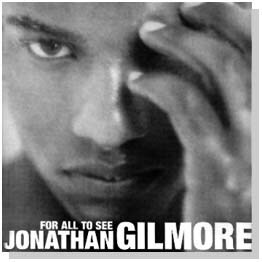 Sounding something like a cross between Johnny Mathis and Billy Joel, Gilmore is a first-rate vocalist. Starting with "It Ain't Enough"--featuring heart-tugging lyrics, a listener-friendly melody and lush arrangement--the singer stakes his claim as a contender in the romance sweepstakes. "Free" is even more appealing, thanks to the underlying urgency in Gilmore's delivery. Gilmore characterizes the songs on For All to See as "relationship-oriented, pop-tinged jazz ballads," an accurate enough assessment, though one might argue about the "jazz" tag. In any case, Gilmore is a competent craftsman who manages to skirt sappy clichés for the most part--no mean feat in a genre that often tends toward the maudlin. Raised on everything from European art music to pop to R&B, Gilmore initially formed a band in the late '80s dubbed the Media, which toured southern California's college circuit and cut a demo before splitting up. In the intervening years, Gilmore has returned to San Jose and, at long last, signed a record deal. He has also sharpened his skills as a singer and songwriter. While many of his songs begin as poems, Gilmore's approach is pragmatic. "If I'm feeling something I want to write about, I'll keep it vague so that other people can relate to it. Sometimes a song can come out of a jam session; other times, a melody will come to my head." Gilmore is quick to acknowledge that his maiden voyage was very much a collaborative affair. The bulk of the material was co-written with producer and engineer Mark Johnson; Gilmore came up with most of the arrangements. Comparing his own writing style with Johnson's, Gilmore says, "I tend to write with a broader horizon than Mark, who writes in riddles in a way. When I sing his songs, sometimes I have to ask him what the hell he means." "When You Turn It Around," Johnson's stab at social commentary, is indeed enigmatic (or merely muddled--one couplet compares Louis Farrakhan to David Duke). Gilmore's disc hasn't yet hit the chain record stores, but for those who like pop right down the middle of the road, For All to See is worth tracking down. Though now an invisible man on the local music scene, Gilmore doesn't plan to keep up the disappearing act: "I'm someone who is not gonna come out with one CD and disappear. I've got a game plan."